S’mores is many people’s childhood favourite. They remind me summer family BBQ’s, because someone will always bring giant marshmallows to roasted at the end. I still remember the first time I had a roasted marshmallow, I thought it was the best caramelized sweet I’ve ever tasted. S’mores was the best part the BBQ, nothing can really replace the fun of making this sweet, warm, and gooey dessert. 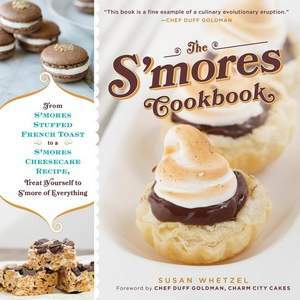 I was so excited when I received The S’mores Cookbook by Susan Whetzel. I think s’mores is one of the best ideas for a cookbook, it’s almost a no-brainer for attracting the interest of an average cookbook reader because most of us can relate to the flavours of s’mores. Some of the dessert variations in the cookbook are quite clever, such as the s’mores inspired frozen treat section in the book. 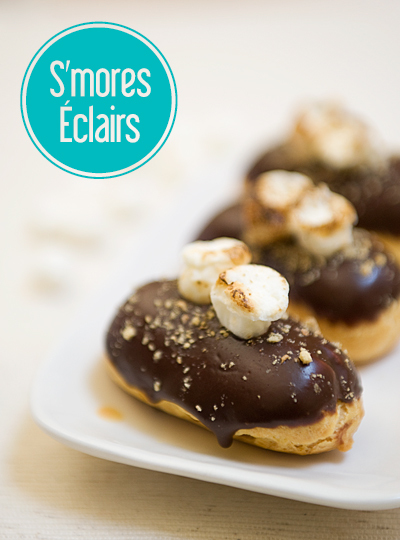 I chose the éclairs recipe to share here because the textures of an éclair are so different from that of a s’more. I wanted to see if an éclair can still carry of flavours of a s’more. Preheat the oven too 400°F. Prepare 2 large baking sheets with parchment paper. Set aside. In a heavy-bottomed medium saucepan, bring the milk, water, butter, sugar, and salt to a boil. Once the mixture is at a rolling boil, add all of the flour at once, reduce the heat to medium, ans stir the mixture quickly with a wooden spoon. After 1 minute, reduce the heat to low and stir for 3 more minutes. The dough will be smooth and shiny. Transfer the dough into the bowl of a stand mixer fitted with the paddle attachment. Beat the dough for 5 minutes to cool. Add the eggs one at a time, beating for 1 minute after each egg as been added. The dough will separate, but it will come back together after some time. Place the dough into a piping bag with a 1" opening. Pipe the dough into 3-4" length onto the parchment-lined baking sheets. Use a moistened finger to touch up any jagged dough edges, if necessary. Bake the éclairs for 20 minutes, or until puffed and golden brown. Rotate pans halfway through the baking time. To make the filling, fold he graham cracker crumbs into the whipped cream. Once the éclairs are cooled, fill with whipped cream, using a long, narrow piping tip. Baked but unfilled eclairs and cream puffs can be stores in freezer for up to 6 months in an airtight container. Excerpted from The S'mores Cookbook by Susan Whetzel © 2013 Adams Media, www.adamsmedia.com. May not be reprinted with­out pub­lisher permission. Heat cream in a small saucepan over medium-low heat. Bring to just a simmer. Remove from heat. Add the chocolate chips to the hot cream. Allow to site for 30 seconds. Stir until well combined. I really enjoy the flavours of this dessert, though it doesn’t have the texture of the actual graham crackers, the cream inside was flavoured with them, just enough and not too overwhelming that it would ruin its creaminess. Notice that the method in the book doesn’t actually indicate what to do with the chocolate ganache, but looking at the photo from the book, it was to dip the tops of the éclairs in. The toasted marshmallows were my personal touch, again, not instructed in the book. I toasted mini marshmallows with a blow torch, let them cool before placing them onto the éclairs when the ganache was not yet set. I think you can really be creative with any recipe in the book, as they are so straight forward and simple. Feel free to experiment! I am starving looking at these pictures now. 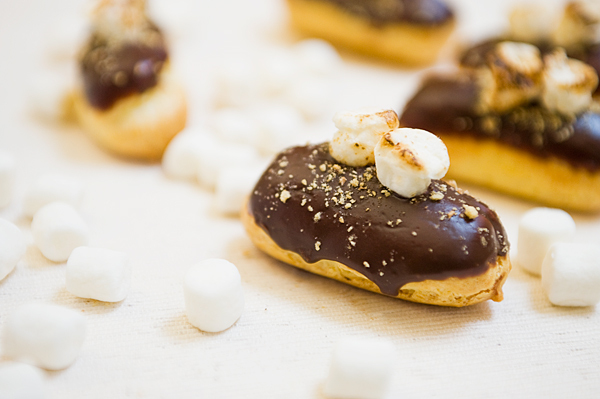 S’more and eclair sounds so perfect together. I am bookmarking this now. Thank you for the lovely compliment! Hope you have fun making it!